The associated trigram for Palgwe Il Jang represents “Keon” (heaven, light), therefore, this Poomse should be performed with the greatness of Heaven. This form symbolizes the beginning of the universe, and consists of fundamental and basic movements, which will establish a firm base for beginners. 20 Movements, 0 kicks, 2 punches, 2 keup. Start on a ready stance (Joonbi). Left turn 90°, left front stance, left hand low block (Ap Kubi Arae Makki). Step up right front stance, right hand outside block (Ap Kubi Momtong Makki). Right turn 180°, right front stance, right hand low block (Ap Kubi Arae Makki) . Step up left front stance, left hand outside block (Ap Kubi Momtong Makki) . Left turn 90°, left front stance, left hand low block (Ap Kubi Arae Makki). Step up right back stance, right hand outside block (Dwit Kubi Momtong Yop Makki). Step up left back stance, left hand outside block (Dwit Kubi Momtong Yop Makki). 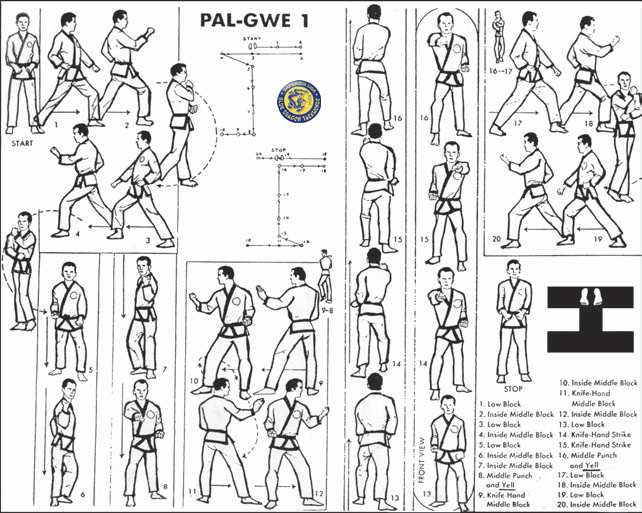 Left turn 270° counter clockwise, Left back stance, double knife hand middle block (Dwit Kubi Sonnal Momtong Makki). Right turn 180°, right back stance, double knife hand middle block (Dwit Kubi Sonnal Momtong Makki) . Step up right front stance, right single knife hand (Ap Kubi Sonnal Mok Chigi). Step up left front stance, left single knife hand (Ap Kubi Sonnal Mok Chigi). Left turn 270° counter clockwise, left front stance, left hand low block (Ap Kubi Arae Makki). Right turn 180°, right front stance, right hand low block (Ap Kubi Arae Makki). Step up left front stance, left hand outside block. Left turn 90 degrees to starting point, and assume ready stance (Joonbi), left foot steps back (Ap Kubi Momtong Makki).